I don't like to crow, but after the first round of matches, I said to my son James that I thouught Germany would win the World Cup. He favoured the Netherlands, after their victory over Spain. After tonight's 7-1 victory over Brazil I think everyone will be saying that Germany will win. They will beat Argentina in the final, and The Netherlands will scrape a narrow victory over Brazil in the 3rd place play off. Seven is supposed to be a lucky number, but try telling that to the Brazilians! Hehe... the good news though is that Brazil have a new drinks sponsor! 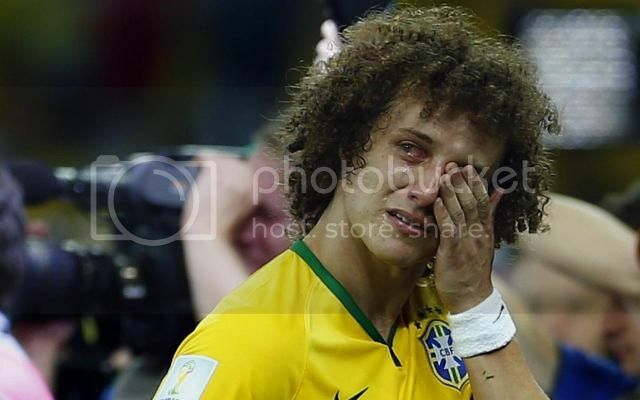 Well the host country was certainly humiliated ! Brazil coach Scolari said it was the worst day of his life ! For a team that hadn't lost a competitive match on home soil for nearly 40 years, losing 7-1 to Germany was a huge shock and a national disgrace. Germany scored 4 times in 6 minutes in the first half as the Brazilian defence imploded completely. Klose achieved a record 16th World Cup goal before Oscar eventually got scant consolation in the 90th minute which the commentator described as the most pointless of goals. So Germany go into their 8th World Cup Final and must now start favourites, although it would really rub salt in Brazilian wounds if Argentina could beat Holland in 2 hours time. In the third place play-off match Brazil conceded 2 goals in the first 17 minutes but it wasn't quite the capitulation of the semi. The Dutch scored again late on to make it 3-0 to complete Brazil's worst ever World Cup in terms of goals conceded. In fact it was the first time they'd lost 2 consecutive home games for 74 years ! I think in conclusion we have to say the hosts weren't as good as we thought and were unable to make home advantage tell when it mattered most. Congrats to Germany winning the World Cup against Argentina, 1-0. In overtime, no less! and in the beginning the Lansings made loudspeakers and they are still here today, a well deserved spot in Speakers corner. Yes it was the fourth time Germany won the World Cup and the first since reunification with the East. It was the first time a European side had won in South America and the third consecutive World Cup won by a European team. And with that I'll put my anorak away for another four years ! The good news for me is that we (Man United fans ) can have our new manager now! Louis Van Gaal's Dutch team did better than most people thought they would and his stature has improved further as a result. He starts in Manchester in two days' time - then flies with his new team to the USA for an important tour there a few days later. When asked if he would be taking a summer break after his World Cup marathon, he said "No - holidays are for wimps!" Glad Germany won though, they are clearly the best team out there at the moment so well done for them.